With the recent revitalization of Disney Springs, Walt Disney World has it's very own food and shopping mecca within the borders of the massive resort. 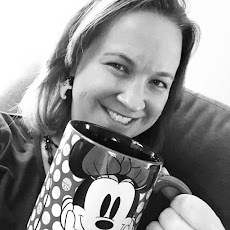 We don't regularly get a chance to visit Disney Springs on our family trips as we spend most of our time in the parks with the little ones, but when I visited with my friend for a runDisney weekend, we took the chance to enjoy a few of the restaurants Disney Springs has to offer. The first was Chef Art Smith's Homecomin'. 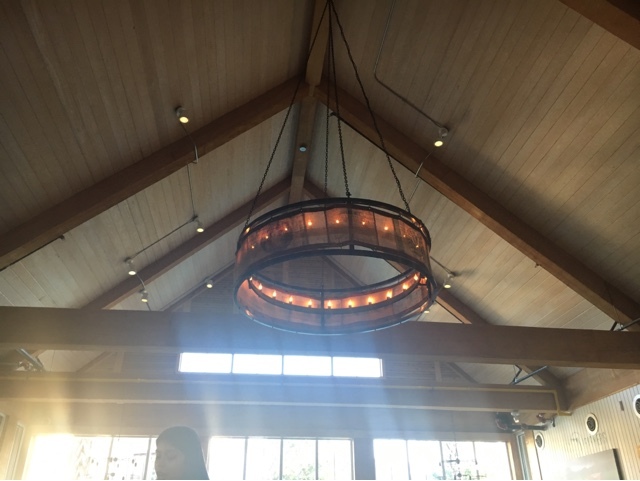 The decor looks like something that Chip and Joanna Gaines would have designed on Fixer Upper. Inside and outside of the restaurant feature calming colors and a rustic country design. We had reservations and were seated quickly after arriving. 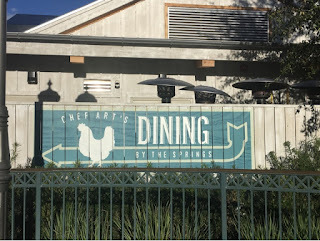 The restaurant is not very big compared to some of the other spots in Walt Disney World, so reservations do tend to book up unlike at some of the other Disney Springs locations although you probably don't have to be on right at the 180 day mark to grab your table. While I'm not an expert on celebrity chefs, I did know that Art Smith is famous for his fried chicken. However, when we sat down with the menu, I wasn't sure that a big southern meal of fried chicken and heavy sides was what I needed in the middle of my Glass Slipper Challenge races. So instead, my friend and I decided to split and appetizer and then order salads. To give us a taste of the famous fried chicken, we opted for the Thigh High Chicken Biscuits for our appetizer. The plate included three biscuits that had both fried chicken and pickles then drizzled in honey. Everyone was right - the fried chicken was to die for! 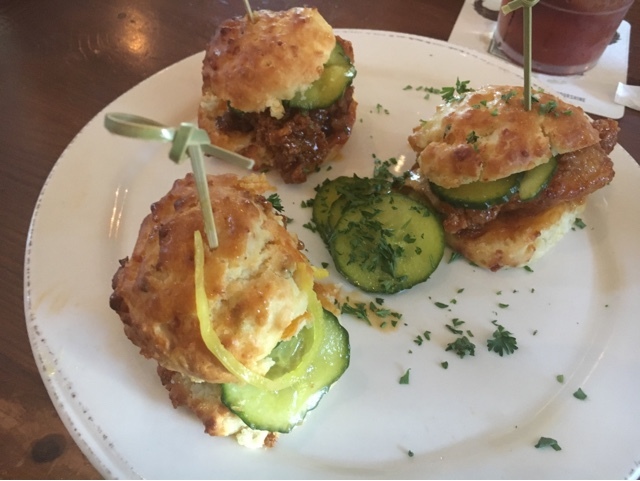 We thought this appetizer was the classic southern comfort food that you would expect to be delicious here. 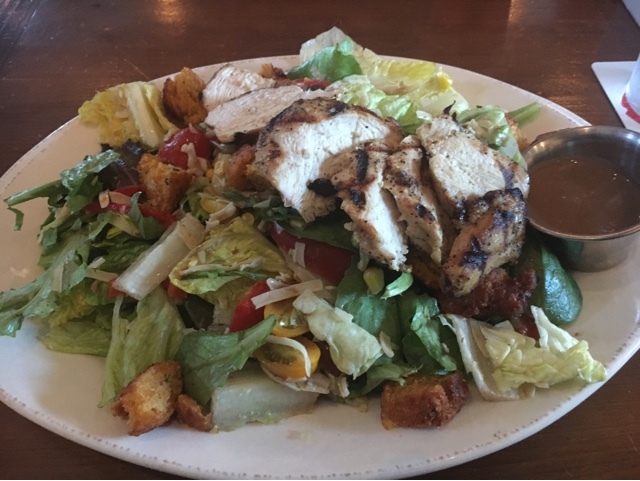 My dinner was a simple grilled chicken salad with balsamic dressing. Everything was fresh and wonderful. And even though we heard amazing things about the dessert options, we decided to pass on dessert to make sure we weren't to weighed down for the race the next day. Overall, Chef Art Smith's Homecomin' is a delicious delight located in Disney Springs. For anyone that likes traditional down-home southern comfort food, this should be a must-do on your dining wish list. The prices are reasonable too which always helps! Maybe next time, I won't be on race weekend and will be able to enjoy even more fried goodness from this delectable restaurant!